When the pan is hot, add 2 tablespoons of oil and increase the heat to medium low. Using a wooden spoon, sauté the onions until translucent. Add the meat and continue to sauté until lightly browned. Add tomatoes, 1/2 the breadcrumbs, salt, pepper, garlic, cinnamon, bay leaves, allspice, cloves, wine, and tomato paste, and mix well. 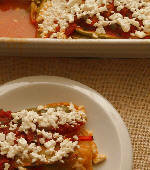 Reduce heat, cover, and simmer until all the liquid has been absorbed, about 45 minutes to an hour. If there is still liquid in the pan, continue to simmer uncovered, stirring to prevent sticking, until the mixture is as dry as possible. To prevent the final dish from having too much moisture, this step is crucial. Lightly oil a large baking or roasting pan and sprinkle the bottom with the remaining breadcrumbs. Place a layer of potato slices on the breadcrumbs (it’s ok to overlap) and spread the meat mixture evenly on top. Cover with the remaining potato slices, and carefully pour the béchamel sauce evenly over the top. Bake for 30 minutes, then sprinkle the cheese over the top, and continue to cook for another 15 to 30 minutes, until golden brown. 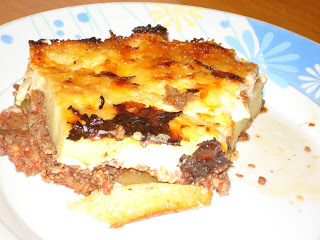 Remove the moussaka from the oven and allow to cool for 20-30 minutes. 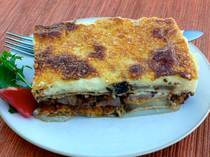 Moussaka is traditionally eaten warm, not hot, can also be eaten at room temperature, and is great on the second day.